Bobby came into our care with a badly infected bite on his leg. Fully healed and recuperated he’s now ready for his forever home. 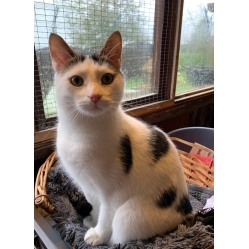 Bobby, just over a year old, is friendly and would suit most homes without other cats or dogs – sensible children would be fine. Please note we only rehome on quiet roads locally (southern Manchester including Stockport, Wythenshawe, Buxton, Macclesfield, Wilmslow and the like) so post-adoption support can be given should it be necessary. Please, if in doubt, get in touch to check – we pride ourselves in getting a perfect match. Note too, we ask for a minimum adoption donation of £60 per cat to help towards our costs preparing them for their new homes.